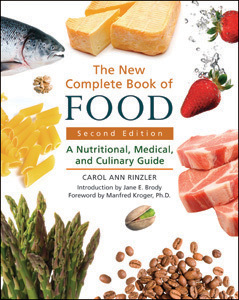 Authored by: Carol Ann Rinzler; Introduction by Jane E. Brody; Foreword by Manfred Kroger, Ph.D. The New Complete Book of Food, Second Edition provides the nutritional, medical, culinary, and consumer information essential to planning a good diet and properly handling food. In more than 300 A-to-Z entries, this comprehensive resource catalogs the physical, chemical, and medical properties of food; their benefits and hidden dangers; how foods change when they are processed or cooked; how to properly select, prepare, and store food; and much, much more. Each entry has been revised and updated to reflect the most current information available about diet and nutrition. Most updates have been made to the Nutritional Profile, Medical Uses and/or Benefits, Adverse Effects Associated with This Food, and Food/Drug Interactions. "It is good to have an updated version of this standard reference, which is almost like a Physician's Desk Reference for food...straightforward...easily interpreted. An excellent resource for high-school, public, and college libraries." "...easy to understand and use...very useful...Recommended." "This book should be in all libraries that cover food and nutrition and would be a great help to homemakers...a good place to start to gather information on this topic."